Dutch Marines Rowing Challenge, a team of former Dutch marines, will Saturday 10th June challenge the English Marines in a rowing event on the Medway between Upnor Castle and Rochester Bridge, finishing at Nelson's Gate on the Dockyard terrain. 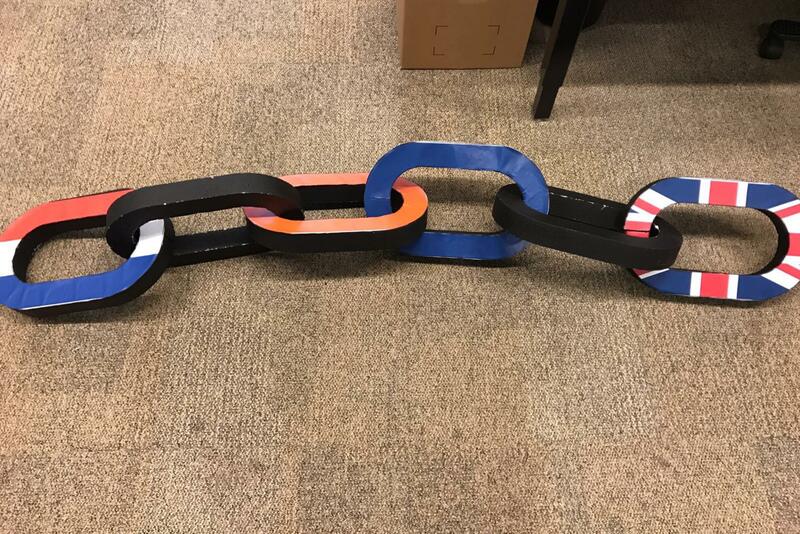 Dutch dredging and marine contractor Van Oord supports this race by designing a floating "chain" that will act as finish line. Other parties can participate by signing up via us. Admiral Holmes executed a brutal attack on the island of West-Terschelling in August 1666, sinking 150+ merchant vessels and destroying half the island and its inhabitants. States Pensionary Johan de Witt wanted to retaliate by taking up an old plan to invade London by sailing up the Thames. This plan was to be executed just months after the plague and a fire had devastated the City. Admiral of the Fleet Michiel Adriaenszoon de Ruyter (Immensi Tremor Oceani: Great Terror of the Oceans) advised him on a slightly different plan. He knew the English fleet would be at anchor and unguarded in the Thames estuary: the River Medway. De Ruyter sails his ships to Upnor Castle where one of his captains, Jan van Brakel, breaks through a chain across the river. It is still a mystery how he accomplished this historic feat: either by sinking the floating barges the chain was resting on or using Marines to unlock one side. An investigation into the precise location of this chain is still underway in the British Admiralty Archives. Dutch Archives were burned in the 19th century. Rowing was the primary means of getting the huge ships up the river Medway. Against current, tide and wind the ships were not able to sail to Chatham unassisted. By rowing the anchors to the maximum length of their chains, dropping them and hauling them in while pulling the fregates with rowboats at the same time it took the fleet more than a week form Sheerness to Upnor Castle. After dredging parts of the River Medway with the help of local pilots (the Dutch paid them) a large part of the fleet was able to get close to Chatham. The fleet passes some ships sunk by the English to block his passage and take two ships, Unity and the flagship Royal Charles, back to the Netherlands. During the final battle at Upnor Castle the first 50 Dutch casualties resulted in a retreat to the Thames estuary. De Ruyter concluded that there was no use in overstaying his visit after destroying the combined English fleet and taking Unity and Royal Charles as loot to the Netherlands. The stern-piece of the latter can still be seen in the Rijksmuseum. The Battle of Medway sets in motion the end of the Second AngloDutch War and a, for the Dutch favorable, peace treaty is signed in Breda shortly afterwards. Sovereignty is guaranteed for the Dutch. The English still call this "our most glorious defeat". The Breda peace treaty was signed a month later and will be celebrated August this year.